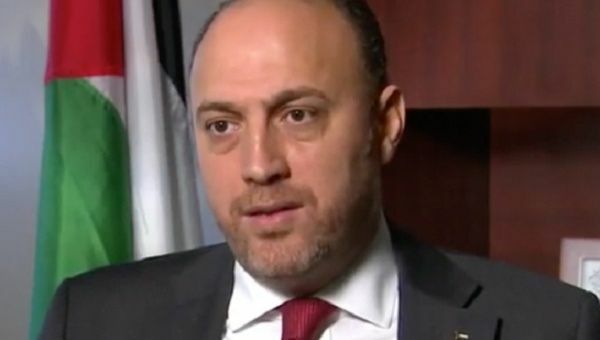 In the latest move to bend the will of Palestinians, the U.S. revoked residency permits of Palestinian Ambassador Husam Zomlot and froze his family bank accounts. 17 Sep 2018 – The United States, in yet another attempt to force the hand of Palestinians, expelled the Palestinian Ambassador to the U.S. Husam Zomlot. The family’s bank account has also been frozen. This came few days after the U.S. State Department ordered the closure of Palestine Liberation Organization’s embassy in Washington. Wasel Abu Yousef, a PLO executive committee member, said that Zomlot has been in Ramallah for four months. “Ambassador Zomlot’s son Said, 7, who is in second grade, and daughter Alma, 5, who is in kindergarten were pulled out of Horace Mann Elementary School in Washington DC last week and have since left the country,” the PLO said in a statement. The expulsion of Zomlot and his family from the country is being done to force Palestinians into starting unconditional and one-sided peace negotiations with Israel. “By deliberately targeting the family of Ambassador Zomlot, the U.S. administration has gone from cruel punishment to revenge against the Palestinians and their leadership, even to the point of causing hardship to their innocent children and families,” PLO executive committee member Hanan Ashwari said in a statement. In the last weeks, Trump has frozen nearly all foreign funding for Palestinians. The United Nations’ Palestine refugee agency UNRWA, the East Jerusalem Hospital Network were two organizations from which funds have been withdrawn. On top of the funding cuts, the U.S. has also reduced US$10 million in aid to the Palestinians for programs supporting conflict resolution with Israelis. This added more than US$500 million to other cuts. The portion of the money involving Palestinians in the occupied West Bank and Gaza Strip was being redirected to programs between Jewish and Palestinian citizens of Israel, a U.S. embassy official said on Sunday. The official said the funds would be used “to enhance” programs in Israel instead. Under the 1993 Oslo Accords, the colonization of Palestine, for the first time, was accelerating with the consent of the Palestinian leadership. As well as his international disasters and the ruination of the US for anyone not rich, POTUSTRUMP has a particularly mean, cruel and vicious streak and will do anything to destroy the lives of anyone who dares stand up to the Zionist entity’s illegal actions.